Erratum: Last week I referred to the “impressive dog-and-pony (here, snakes and staffs) show” put on by Aaron and Moses when they meet with Pharaoh. That occurs in this week’s portion, not last week’s. I have corrected last week’s post accordingly. In this week’s portion, Moses and Aaron receive additional training in Effective Presentations – Signs and Wonders. Their next meeting includes a flashy display in which Aaron not only turns his staff into a serpent, but his serpent swallows the Egyptian staff/serpents. Note that the word used for serpent here, tanin, differs from the word used earlier, nachash, and may be better translated as crocodile (http://www.zootorah.com/essays/crocodile.html ), sea serpent, or dragon (Greek). In any case, Pharaoh still resists, so it’s time for the plagues. This week, we read about the first seven: blood, frogs, gnats or lice, flies, cattle plague, boils, and hail. Whatever you accept as the explanation for specific plagues, there remains the question of why? There’s an obvious goal of demonstrating the power of the Lord to the Egyptians. Nehama Leibowitz points out that references to “knowing” occur 10 times between Exodus7:5 and 14:18 (New Studies in Shemot, pp. 170-171). The 15th century Spanish commentator Isaac Abravanel divided the plagues into three groups, representing aspects of the Lord that the Egyptians needed to acknowledge: (1) the Lord exists, (2) the Lord punishes and rewards, and (3) the Lord can change the nature of things at will (Leibowitz, pp. 172-173). Another goal is to demonstrate these properties to the Hebrews. Pharaoh’s bricks-without-straw edict had distracted them and caused them to doubt the possibility of redemption. They needed the concrete demonstrations of divine power as much as, or more than, the Egyptians did. Andrew Cromar, an electrician, was fined £150 for ignoring police requests to turn off the “watch-frogs” placed in his garden to deter vandals and thieves. Glasgow District Court heard that the frogs’ sensors were so sensitive that loud croaking could be activated by gusts of wind and washing flapping in a neighbouring garden. Mrs Watt said she eventually snapped when two of the frogs croaked at her as she went shopping. She picked them up and threw them in a rubbish bin, but when she returned the frogs were back in place and joined by a third. Eventually, the police were alerted, but Cromar refused to stop the electronic frogs’ chorus. Yesterday, Sarah Barr JP, found him guilty and fined him £150. The frogs, one of which started croaking when it was produced in court, were kept in custody to await destruction. Copyright © The Scotsman Publications Ltd. There once was a powerful Japanese emperor who needed a new chief samurai. A year passed, and only three people applied: a Japanese samurai, a Chinese samurai, and a Jewish samurai. The Japanese samurai opened a matchbox, and out popped a bumblebee. Whoosh! went his sword. The bumblebee dropped dead, chopped in half. The Chinese samurai also opened a matchbox and out buzzed a fly. Whoosh, whoosh, whoosh, whoosh! The fly dropped dead, chopped into four small pieces. Now the emperor turned to the Jewish samurai. The Jewish Samurai opened a matchbox, and out flew a gnat. His flashing sword went Whoosh! But the gnat was still alive and flying around. What has four legs and catches flies? Your cow quits the family dairy business and applies for a job at Burger King. She starts giving you Milk of Amnesia. Your cow joins the Hell’s Angels because, hey, it already has a cool leather jacket. Your cow starts smoking its grass rather than eating it. Your cow spends half the day sitting in the Lotus Position chanting “MOO” backwards. Date of Injury: September 26, 2507 B.C.E. The claimant appeared for an independent Medical Evaluation based on his assertion that he has a disability because he has become so depressed that he cannot continue in his usual occupation as a farmer. Mr. Job notes that on the morning of September 26, 2507 B.C.E, he was feeling fatigued, and had been resting from working in his fields, when a cloud of locusts appeared and began devouring his crops. He ran to the house to get help in flailing away the insects. However on his way to the house, he discovered his cattle all lying on the ground dead. He arrived at his house, only to find it in flames. His wife and seven children were all inside, burned up. Mr. Job states that he then fell to his knees and prayed to God, only to discover that his entire body was covered with boils. Since then, his neighbors have shunned him. It is Mr. Job’s claim that he has been so upset by these events that after vainly trying to chase the locusts away, he simply let them eat his crops. He said that he has not been able to return to work since that time. Assessment: It is clear from his account that the claimant has a history of feeling fatigued in connection with farming work. He admitted that the work-related fatigue began prior to his applying for the disability insurance. It seems quite evident that his so-called depression is an offshoot of this…a psychologically motivated effort to avoid gainful employment. He did show signs of open sores, but these are likely to be self-induced. In my opinion, Mr. Job has a form of Munchhausen Syndrome where he is driven to excoriate his skin, fueled by a covert psychotic disorder. I infer the psychosis from his mutterings about God and the Devil being behind his problems. In conclusion, I see no basis for compensating this man for an obviously pre-existing condition. A photo of chest-deep hail is generating plenty of skepticism online, but according to weather experts and local witnesses, it’s all too real. A major spring storm swept through West Texas on Wednesday, offering new evidence that everything really is bigger in the Lone Star state. 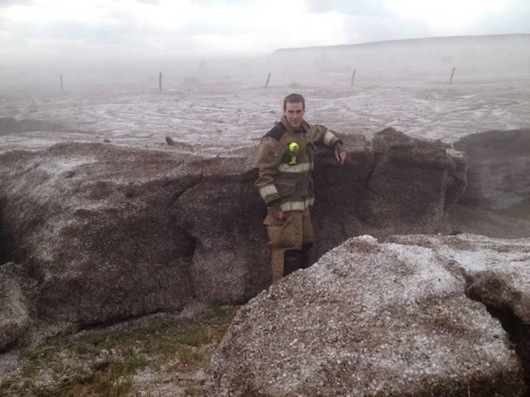 The storm dumped incredible amounts of hail around Amarillo — so much hail, in fact, that many people have declared a photo of the piled-up precipitation to be literally incredible. “Seriously people, he [is] standing in a crevasse between rocks. … Come on! !” one Facebook commenter wrote. “Looks like another big Texas Tale,” another added.